Lissa Bryan: The #ShieldGeeks Review #VIKINGS Season Finale! The #ShieldGeeks Review #VIKINGS Season Finale! We are SO excited! So, Warriors and Shieldmaidens all, get your weapons and armor ready, because we're wrapping up an amazing season! Lissa: Hard to believe it's the season finale already. This has been an action-packed season, with some pretty significant plot developments, and we've said goodbye to some important characters. Sandi: I have a list of dead people that I saw in this episode. Named characters, I mean. I'll add it to the end of this post. This has been a great second half of a season. So many were unhappy at the end of the first half of Season Four, but this half has really been very true to form, even if we aren't always thrilled with the directions Michael Hirst and History Channel have gone. Lissa: This episode begins with a frail Ecbert rocking in his throne, obviously in great distress. I think the implication was that he somehow knew the battle was going poorly. We cut to the battle between Aethelwulf's forces and the Great Heathen Army, right where we left off. The Vikings have ambushed Aethelwulf's troops and after the bowmen pick off a large number of them from their position high on the ridge, the rest of the Vikings run in for melee combat. Sandi: Ecbert's frailty has been more evident with every episode in this half of the season. It's as if he's aged years in the course of these months. I don't know exactly how long it's been, story-wise, but it hasn't been as long as his face and beard make it out to have been. And, yeah. I really like how History Channel hosts a war. Even the clumsy fighting in Kattegat last week is indicative of how they understand the choreography necessary to make it work and work well. Lissa: It's obvious the Vikings have the upper hand. Aethelwulf, lying in the mud, looks up wearily to see one of his soldiers cut down by a Viking shieldmaiden. Aethelwulf frantically shouts for a retreat. Sandi: A retreat is not a bad thing for a battle commander to order, by the way. Some people think it's an indicator of cowardice, but Aethelwulf has proven himself already and his men clearly trust him. If he says to scoot, they scoot, and no one thinks ill of him as a result. After all, he's saving lives. Some, anyway. Lissa: He reaches the palace and orders an evacuation, but Ecbert refuses to go. He says staying behind is God's will, and his own. @LissaBryan "This is God's will. It is also mine." - shades of King Henry VIII. God and my soul are in perfect accord or something? Sandi: Part of me sees this as part of the penance that Ecbert is planning for himself. As if by one great act of expiation, he can atone for all that he has done in his life. Lissa: Aethelwulf is aghast. He can't leave Ecbert, the King of Wessex, behind to die. Ecbert calmly tells Aethelwulf he's going to abdicate. They both kneel before an altar and a bishop performs a brief ceremony, asking if Ecbert [long string of titles] intends to surrender the crown. It's the crown, @smidbeach reminded us, that Ecbert took from the tomb of the kings and queens of Mercia when Wigstan abdicated. The crown and scepter are passed to Aethelwulf. Sandi: It's not Aethelwulf's fault the crown looks a lot like the one on the Burger King fellow in the commercials! But seriously, here we see Ecbert doing this noble thing and giving his crown to his son. Still, would you expect Ecbert to ever do the right thing when he gained nothing from it? Right. Lissa: That finished, Ecbert tells his son, “I know I have placed my kingdom in the safest hands. You go now, save yourself and your family.” The phrase "your family" wasn't lost on me. Judith and Alfred aren't really Aethelwulf's - they've been Ecbert's, and Aethelwulf has always revolved on the periphery, like a distant planet that eventually gets downgraded as being just one of the objects in the Kuiper Belt. But Ecbert hasn't just handed over his kingdom. He's handed over Judith and Alfred, the two people he cherished more than his own son. He tells Aethelwulf to gather his strength and come back to reclaim what is his one day. Sandi: Thing is, even though these are the Last Words from a father to his son, I still don't see them as sincere. The most sincere things he says are what he says to Alfred—Athelstan's son. Because it is with the young man that Ecbert's hope truly lie. He wants his name and influence to live on and Aethelwulf is not the man in whom Ecbert sees that happening. Lissa: The palace is evacuated and the royal family climbs into a carriage. Ecbert gives his son a kiss. He leans into the carriage and gives some hurried words of wisdom to Alfred about a Christian king's greatest virtue being humility. Lissa: Judith thanks Ecbert for loving her, which struck me as a bit odd - and I wasn't the only one. @LissaBryan@sandyquill "Thank you for loving me?" Chick, he bulldozed you into an affair that could've cost you your remaining ear. Sandi: It really began poorly, yeah. But Judith was not blameless, either, so I guess she kind of came to a sense of balance in herself. Lissa: But I imagine over the ten-plus years of their affair, Judith came to see it as the best thing that ever happened to her in terms of personal freedom. Her husband has evolved from the prim, priggish fellow he was when they first married, but it's true that Judith was able to do much more in her life as Ecbert's mistress than she ever would have as Aethelwulf's wife. Sandi: Very true. She had stepped from the confines her world and that freed her, even if she wasn't seen as "proper" any longer. This does not mean I advocate for adultery by any means, but it does show how some bravery and brass can help propel a person into different spheres of influence. Lissa: After the family and troops leave, Ecbert embraces the bishop who remained at his side. The men retreat back to the throne room where they sit in silence and drink. 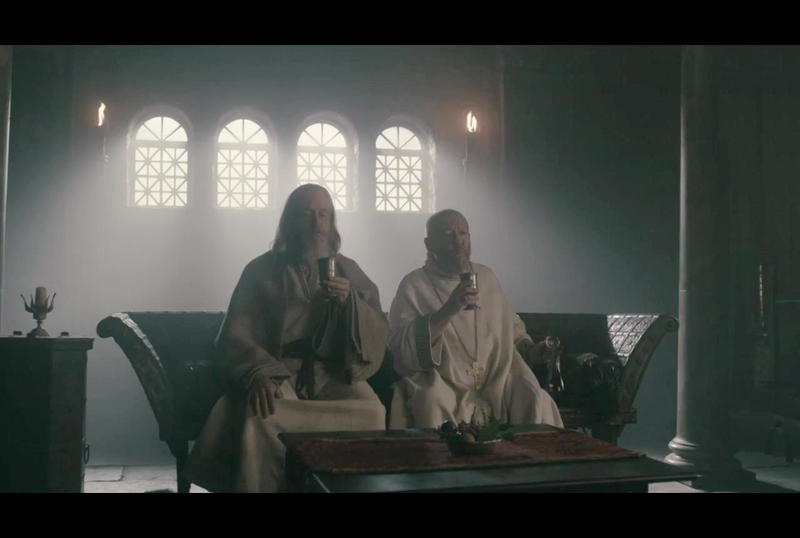 All of us had the reaction that Ecbert was wishing it was Ragnar sitting there, sipping his wine. Sandi: It was interesting that the scene was silent, essentially. There was nothing here that could be said. One presumes the bishop at Ecbert's side knows all his flaws so there is no coy conversation, no exploration of thought. Just two men who are facing the end of their lives. A silent drink is appropriate. Lissa: The Vikings arrive at the city and are at first wary to find no one there to defend it. After they confirm it's empty, they run inside to pillage, cheering. In the crowd. Helga is tugging her Shiny New Kid along behind her as she runs to keep up. Sandi: And we were sitting there, wondering how on earth Helga and Tanaruz (aka Shiny New Kid) had managed to get there. And we were still wondering why. There is a desperation to both of their faces, and one can't blame them. Lissa: Floki - may God have mercy on his soul because I cannot - finds Ecbert's treasured library that Athelstan was translating and copying, and he... I'm having trouble typing it... He torches the scrolls. Sandi: This was a wanton act of destruction, made for spite, because Floki knew what the scrolls were. He knew and despised Athelstan, but he wasn't ignorant of the man's work or anything. Floki was just abolishing something he wanted obliterated, though it posed no threat. Neither would it bring profit. And since he burned it then, it wasn't even going to be useful as a fire-starter in the future. Just . . . a waste, really. Lissa: I hated this scene. Hated it because I knew it was true to history. So much knowledge and learning was lost down through the centuries when libraries were encountered by cultures who didn't appreciate the scholarship of those they'd conquered. @LissaBryan@mrszoomby@DeeDonuts Hypatia screams from the ether. Sandi: And, our readers can ascertain, this kind of thing is a big deal to Lissa and me. The rampant destruction of such work just gets to us. Alas, it happened and cannot be undone! Lissa: Helga leads the New Kid down a hallway in the palace while the fires rage and the murderin' is still going on. A flaming beam falls in their path and the girl screams. Helga kneels to assure her that she's safe and loved. The girl grabs Helga's knife. She stabs Helga before turning the blade on herself, driving it into her own heart. The kid dies instantly, but Helga is still clinging to life when Floki finds her. She tells him he's special, unique, and the world isn't large enough for him. He pleads with her, but she goes limp in his arms. Lissa: This was a terrible moment. When Helga was first injured, I was wryly joking about Helga needing to find herself a new kid, thinking she wasn't seriously hurt because of the lack of visible blood. But by the time Floki found her, I realized that this might be the end of Helga's story. It made me sorrowful, not only because I liked her so much - both her character and the skillful Maude Hirst who portrayed her - but because I felt it was an unworthy way for Helga to go. Helga was essentially felled by her ovaries — her unhinged (and abruptly introduced) longing for a child led her to kidnap a deeply traumatized girl from her homeland, like a tourist scooping up an exotic animal they have no idea how to care for. Sandi: It really was a terrible way for Helga to go. Her devotion to Floki, to all that he is and all that he's done (save for the murder of Athelstan), has been a hallmark of her character. If she had died for him, it would have been fitting, in my opinion. Or even dying for Ragnar or Björn. A sacrifice of herself for someone she loved/honored. But murdered by a child whom she had kidnapped and held captive? I don't know. It just . . . sits poorly with me. Though I will say that Vikings did have captives and those captives certainly plotted to kill their "owners", I'm sure. At least, mine did! So, is this death a tribute to all those captives the Northmen acquired, perhaps? I rather think not, but one can wonder. Lissa: We had previously speculated that the Shiny New Kid might introduce Floki to the Islamic faith, about which he'd shown curiosity and given a measure of respect. They seemed to be on their way to building a small rapport in the last episode. But the storyline was not destined to be so complex. Tanaruz was just the means to Helga's death. Sandi: This makes me wonder if Floki's fascination with the Islamic faith will appear again in this show or if that, too, is abandoned like the light in the man's eyes? Lissa: Floki gives his beloved wife a lovely burial, laying her out on fine furs before surrounding her with beautiful grave goods. He lays a necklace on her chest and puts a stone in the hollow of her throat. Sandi: This is a lovely example of the traditional burial. Such sites have been found in Great Britain, so it's great that History Channel included one here. Lissa: Later, Björn comes upon him and tells him he's sorry about Helga's death. He'd known her since he was a child. Floki says he's dead, too. The first part of him died with Angrboða. The second part with Ragnar, and now Helga's death has taken the last. He is an empty vessel that the gods may do with as they may. He will drift upon the current, rudderless, drawn by their winds. He tells Björn to take care of himself, rises to his feet and heads down the hallway. His silhouette fades away into the light, as Ragnar's did when Ecbert said goodbye. Sandi: I really want to hope that Floki will return to himself after a period of deep mourning. Lissa: As the fire nears the throne room, Ecbert decides he's had enough. He leaves and heads out into the courtyard where Björn and the other Ragnarssons are watching the carnage. Björn recognizes Ecbert and stops anyone from harming him. The bishop doesn't fare so well. He's slain while he's asking the Lord to forgive the Vikings because they know not what they do. Sandi: Ecbert's appearance must have surprised Björn a bit; he's a far cry from the man he used to be. And he looks like he's wearing a nightshirt or something. The bishop does not try to save himself, it seems. He and Ecbert had both accepted their fates and that was all he wrote. Lissa: The brothers confer together while Ecbert hangs in a cage above. They're not sure what to do with him. Ivar wants to give him the Aelle treatment. Björn says there are bigger political issues at play. Ubbe isn't sure of the wisdom of killing Ecbert, either. He still wants to realize Ragnar's dreams of a settlement, and Ecbert might be the key to that, though Hvitserk protests that Ragnar never ransomed a leader. Sandi: The points of view expressed here are all valid, which is good. No one is completely off script; it's just that making this a cohesive venture is looking less and less likely all the time. May I say, here, that having Ecbert in the dreadful cage is perfect, from my standpoint? I thought it apt for the circumstance and I believe Ecbert did himself. Lissa: In his cage, Ecbert interjects and says he was able to understand most of their conversation, because he speaks a bit of their language. Sandi: Awfully convenient, eh? No, I get it, because there's no interpreter and I rather doubt any of Ragnar's sons have taken the time to become fluent in Anglo-Saxon. Lissa: He has an offer for them. He will give them legal title to lands they can settle. He leaves out the little fact that he's no longer King of Wessex. In fact, he brags he is the "king of kings" and no one could question their title. They ask him what he wants in return, but Ecbert won't tell them unless they agree. Once Björn decides to accept, Ecbert says he wants to choose the method of his death. Sandi: And wow, didn't our band of #ShieldGeeks go off on that! "Wait, wait! He's not a king anymore!" Lissa: Ecbert presents them with the document and pressed his seal to it. Sandi: So, Ecbert the Crafty had one final trick up his sleeve. Historically, Ecbert was apparently obsessed with keeping the lands of the king in the hands of the king. He didn't distribute his lands the way others in other places did. He kept it all together. It is entirely in keeping with that historical rendition that Ecbert first gives the kingship to Aethelwulf then pretends to give lands to the Northmen. Lissa: I was hoping that the tale of the sheepskin (or ox hide, depending on the version of the tale) would be introduced, because it's one of those charming little asides in the Sagas, but it seems that isn't going to be introduced. Lissa: Ecbert is given his final wish. He goes into the hot spring baths with Björn who silently offers him a choice between two blades. Ecbert chooses the smaller of the two. Björn nods and leaves the room. Ecbert disrobes and climbs into the bath. Like Ragnar, he experiences echoes of the past. Ragnar, Lagertha, Judith... He then lowers his arm into the hot water and slices open his veins with the blade. And so passes another "father" of this series. Wily Ecbert who always had layers of intrigues and manipulations, possibly so many that he got lost in his own webs. Sandi: Björn was so merciful, here. So many things that could have happened to Ecbert, but he goes out in a manner of his own choosing, without even an audience to make sure he's actually dying. Trust? Foolishness? I don't know. But it was nice for us to get to hear Ecbert's Greatest Hits in his memories, even if we didn't get to see them as we did Ragnar's. A nice echo back to Ragnar as the episode and season was wrapping up. Lissa: The Ragnarssons are outside in the burned-out courtyard, enjoying a feast. They're celebrating the fact that they now have farmland and can bring new settlers. Björn announces that now Ragnar has been avenged, his destiny leads him elsewhere. He wants to go back to the Mediterranean. Ah, yes--a rousing call for young families in large numbers. Not an exciting call to arms, but exactly what the #vikings ultimately wanted. Sandi: This is actually a great way to wrap up the season. We get a victory party, the sons declaring their future intentions (for when/if we have a time jump before Season Five), and a summation of their goals and aspirations . . . and loyalties. Lissa: Halfdan surprises his brother by electing to join Björn. Ivar wants to continue their push through proto-England. There's no one who can stand up against them. They will do it for the glory of battle and Odin All-Father. Lissa: Sigurd wants to fight onward, too, but he doesn't want to follow Ivar as their leader. He snaps Ivar is not even really a man, but a mama's boy, a snake that crawls on the ground. Ivar retorts that he's not even sure if Sigurd is Ragnar's son, given his penchant for music, and (ahem) enjoyment of male company. Sandi: Yeah, because the whole End-Of-Season Victory Party wouldn't be complete without fraternal sniping. And hey, the Ragnarssons have given us that in abundance, so it's almost fun to watch. Bring popcorn. Lissa: Sigurd bites back that Aslaug was the only one who ever loved Ivar. Despite Ubbe's efforts at peacemaking, the quarrel heats up and Ivar grabs an ax, which he hurls at Sigurd's chest. Sigurd pulls it out and staggers toward his brother, but he doesn't make it far enough to deliver a return blow. He collapses at Ivar's feet, apparently dead. I mean, we'll have to wait until next season to be certain, but he looked pretty-darn-dead to me. Sandi: I'm sure I wasn't the only one watching to see if Sigurd blinked. I didn't see a blink, though. I'm thinking he's gone. Years ago, Ivar's first kill was with a thrown axe, so it is not surprising that he does it again. I don't have the sense that it was something Ivar planned to do—much as he didn't like his brother, they were brothers and I don't see fratricide as high on his To-Do List. Lissa: This is another departure from history, because Sigurd Snake-in-the-Eye married one of Aelle's daughters. His granddaughter married Halfdan the Black after he kidnapped her from her first kidnapper. (The fate of a blue-blooded woman in that era was never an easy one.) They were the parents of Harald Finehair. Sandi: Well, of course, Harald Finehair is already with us, so it's possible that Sigurd was seen as expendable in this particular bit of historical fiction. And yeah, no. I wouldn't have wanted to be a woman of noble birth in this era. They were chess pieces and that's not a fate I'd want for myself. Lissa: We next see a priest, conducting burial rites while Saxons look on and weep. It's our first sighting of Jonathan Rhys Meyer, who has joined the cast. Sandi: Okay, to be honest, I wasn't thrilled with this conclusion of the season. A more natural end would have been the fight amongst the brothers and the death of Sigurd. Sad, but organic. Introducing Bishop Heahmund is sensible from an entertainment standpoint, yes (new big name actor! new character! intriguing possibilities!) but it ended the episode off-key, for me. Lissa: Anyway, she thanks the priest for the ceremony and says her husband is in a better place. The priest has his own idea of how to offer her comfort, and we next see the two of them together in bed. 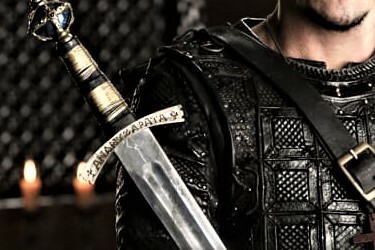 Beside the bed is a set of armor and a gleaming sword with something etched into the crossguard. Sandi: You found it, too! Lissa: From what I found online, it was an early medieval inscription/spell that was supposed to prevent poisoning, an acronym of the words, Antidotum Nazareni Auferat Necem Intoxicationis Sanctificet Alimenta Pocula Trinitas Alma' (May the antidote of Jesus avert death by poisoning and the Holy Trinity sanctify my food and drink). It's found on a 9th Century ring at the British Museum. Sandi: This is an extremely cool detail from History Channel. Lissa loves finding the smallt truths often hidden, so I imagine, my friend, that you were very happy to find that. Lissa: So, what's next for our heathen horde? Will Ivar face any consequences killing his brother? Where is Floki bound, and how will he fare without his beloved Helga? Will Judith and Aethelwulf build a good life together while he seeks to reclaim his throne? Where's Rollo and how's he doing with I-Forgot-How-To-Princess? And how is Lagertha now that the Finehair twins are out of her own artistically-braided hair for a while? I guess we'll have to wait until season 5 to find out! Lissa: Until then, ShieldGeeks, keep those axes sharp, and your hair braided for battle! Sandi: And if you have any thoughts on this episode or predictions for next season, let us know! Thanks for joining us! We hope you'll meet up with us again for season 5! We weren't happy about all the destruction of antiquities and scrolls, either! Accurate, but heartbreaking.